For a really short period of time pCloud has improved and created multiple easy to use and efficient features. So we decided to remind you and give you ideas on how to use pCloud to its fullest. Here are 10 things you can do with pCloud just out of the top of our heads. Backing up your photos, videos and files from all your devices in one highly secured place. We are a cloud storage service after all. You can easily back up all of your social media photos and videos – Facebook, Instagram and Picasa backups are now available. And more is coming! For all the blog writers out there we managed to create the useful tool for your WordPress blog. You can schedule hourly or daily back ups and you’ll never have to worry about your texts again. Access your most important files even if your mobile device is offline – just mark them as favorites and use them on any device, anywhere in the world. Take full advantage of the remote upload from other sites. Just paste the file’s link and save it to your account. The file is available and safe in pCloud forever. You spent New Year’s Eve with a group of friends and you don’t know how to exchange photos? Not a problem – just create a folder and generate an upload link. Share it with your friends and all of them can upload the photos from the party directly to your pCloud account. Your friend e-mailed you the best workout video and you want to try it by yourself? That’s easy, just upload it to your pCloud account and you can access it from you mobile device when you’re at the gym. No excuses for a good workout now! 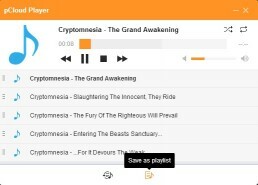 For our Android users we have a delightful and constantly improving audio player. Listen to your favorite music on the go. Remeber, like the other files, if you mark any audio file as a favorite, it will be available to you even if your device is not connected to the Internet. You don’t have to worry about the security of your files or your privacy. All your files are copied and stored on at least three server locations in a highly secured data center with 24 hour surveillance. You can get 10GB of free space.